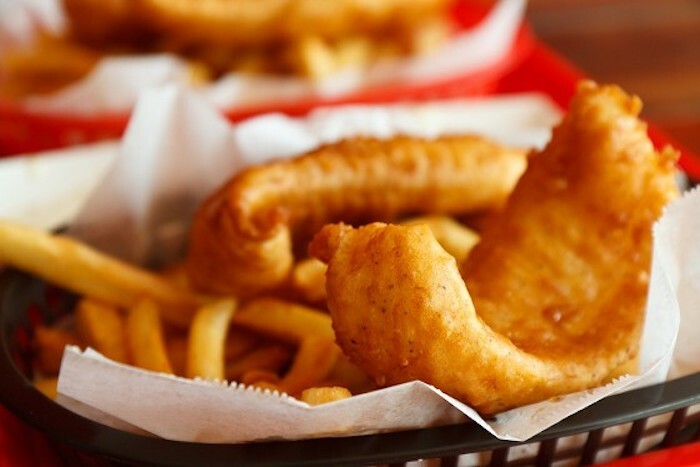 Editor’s Note: Ever wonder what goes through the mind of a fish and chips cook? Wonder no more. I collect things to tell her. Did you know that ‘never odd or even’ is the same backwards and forwards? I think she’d like that. Some of the things in the collection are white lies; like that her mam didn’t wanna see me anymore because I could never get the grease stink out. It’s getting busier. I slide the slice under the fish, check that the batter isn’t burning, then pull across the Perspex door. The hiss of the fryer blocks out the small talk of the server lasses. Every time I go to shake the chip baskets I see her name in flicky writing on my arm, so I think about her at least every minute. That’s in the collection too. I like to imagine she thinks of me sometimes, that she can remember when I took her to soft play at Funland or cuddled her when she cried cos the sea was too cold. I worked out that on a busy day I fry 110 fish. Not bad, that. So I get about 72p for each. I’m going to tell her that and all. Once I caught a fish alive. She used to like that one. Every fish is 72p closer to hearing her sing it again. If I can get that five grand back, Lisa will have to let me. My worst job is slopping mushy peas into those little white pots. I hate the stuff, how it’s a solid lump when it comes outta the tin, then turns into a pile of rank gunge. I’d never make her eat that or ‘owt she didn’t like. I’d buy her the lobster, fresh Whitby catch and show her how to use the tiny fork to dig out the lush meat. That’s in the collection. She deserves nice stuff like that. And she will get it again. I’ll fry ten thousand fish to make sure of it. The next order’s up. One portion of cod and chips. It amazes me how many people come in here and sit there on the lino seats on their own with no bugger to talk to. She’s scrolling on her phone, waiting for thirteen quid fish and chips. She could get them for half the price if she sat on the wall outside. She’s prettier than normal. Looks a bit like one of them lasses out of Little Mix. I bet she doesn’t have kids. I can just tell by the fact she’s not got anywhere to be. If she had a kid, she’d be with him now, doing the magic tap on the bucket before revealing the sandcastle or letting him choose which stick of rock to buy. She catches me looking and smiles. I turn back round towards the strip lights of the fryer. She wouldn’t be smiling at me if she knew I’d gambled away my own daughter’s future. But, I’ll add it to the collection, that I once served one of the girls from Little Mix. Janelle Hardacre is a Yorkshire lass living and working in Manchester, England. She began writing short stories two years ago after taking part in Comma Press’ Manchester course led by Michelle Green. Since then her flash fiction has been published in literary journals including Spelk, Open Pen, Ellipsis Zine and Dear Damsels. She has been longlisted for the Reflex Flash Fiction competition, the TSS flash fiction competition and is a previous winner of the monthly Zeroflash competition. She now splits her time between fundraising for a Manchester women’s charity, freelancing as a PR consultant, writing and being the lead singer of a function band.